When it comes to facial hair, beards always seem to come off second best to the moustache. Sure, like most things these days, they have their own celebratory day- World Beard Day- held annually on the first Saturday of September, but moustaches have a whole month dedicated to them (Movember- raising awareness and funds for men’s health). Sure, they have a band named after them- the humorous and facially-hirsute Australian folk rockers, The Beards- but most bands have at least one member that’s rocking a mo (or at least attempting to), which kind of outweighs a group of four whiskery fellows. Sure, there’s a lot of famous historical figures (and many fictional ones) that have sported fluffy chins, but there have been equally as many famed moustaches throughout the years. 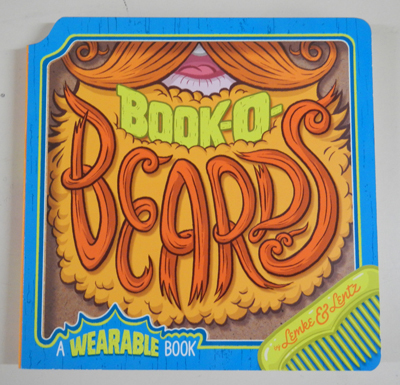 Perhaps as a way to remedy this unbalance, Lemke & Lentz, a two-dad, writer and illustrator team, have released their latest ‘wearable’ board book, Book-O-Beards. The concept is quite simple- open the book, turn it towards whoever you happen to be in the room with, place your nose in the specially dedicated hole at the top of the book, and voila! You have the facial hair of the character on the page! As it is a board book, there are only limited pages, but these few pages allow you to take on the humorous personas of several bearded comrades. You can sport the twig-laden full red beard of a lumberjack, the braided black beard of a pirate, the yellow walrus-style whiskers of a cowboy, the salty grey beard of a sailor, the white fluffy curls of Santa Claus, or the sleek (more moustache than beard) facial hair of a police officer. Children will be entertained by the concept of seeing a familiar face sporting an unfamiliar look, and will more than likely fight to see which hairy strands suit them best. The four-line rhyme on each page will also add to the fun, as the beard-wearer gets into character. Although this book follows an unusual idea, it is quite entertaining and is sure to please even the most facially-follically-challenged.